Did you ever wish music videos came with a button that would allow you to purchase all the cool things featured in them? Well, dream no more! 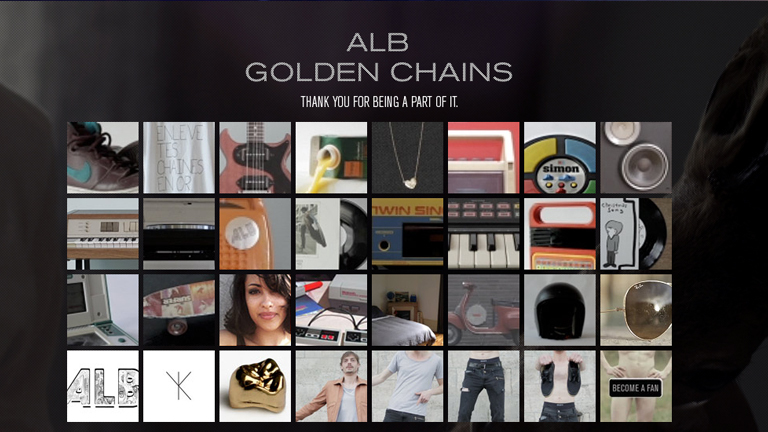 Director Jonathan Broda has done exactly that for ALB’s “Golden Chains”. This Google Chrome based experience pop-us e-bay links and prices for all the things you might be interested in buying: the guitar, the clothes, the motorcycle and even the girl (she doesn’t really have a price but you are re-directed towards a dating platform that would allow you to get one for yourself!). The promo also includes some funny-conceived opportunities for playing a quick game, following the band on Twitter, becoming a Facebook fan and buying the track, but we’ll not spoil all the surprises for you! Did you ever wish music videos came with a button that would allow you to purchase all the cool things featured in them? Well, dream no more! Director Jonathan Broda has done exactly that for ALB’s “Golden Chains”. This Google Chrome based experience pop-us e-bay links and prices for all the things you might be interested in buying: the guitar, the clothes, the motorcycle and even the girl (she doesn’t really have a price but you are re-directed towards a dating platform that would allow you to get one for yourself!). The promo also includes some funny-conceived opportunities for playing a quick game, following the band on Twitter, becoming a Facebook fan and buying the track, but we’ll not spoil all the surprises for you!